Razer has released a new ultrabook as it continues to stamp its name on more categories of gaming gear. Ironically, the gaming hardware maker’s third laptop comes without any real 3D gaming capabilities out-of-the-box. The workaround that the company has developed to overcome that seems promising…on paper. On its own, I’m restricted to all the things that “normal people” do. It’s hard to figure out what the Blade Stealth is for, since it’s an ultrabook that really wants to be a gaming machine, but at first, can’t. With no real gaming capabilities other than the Core i7 processor and 8GB of RAM, on its own I’m restricted to all the things that “normal people” do on computers. You know, word processing, watching videos, Internet and communications (younger people call that “social media”). 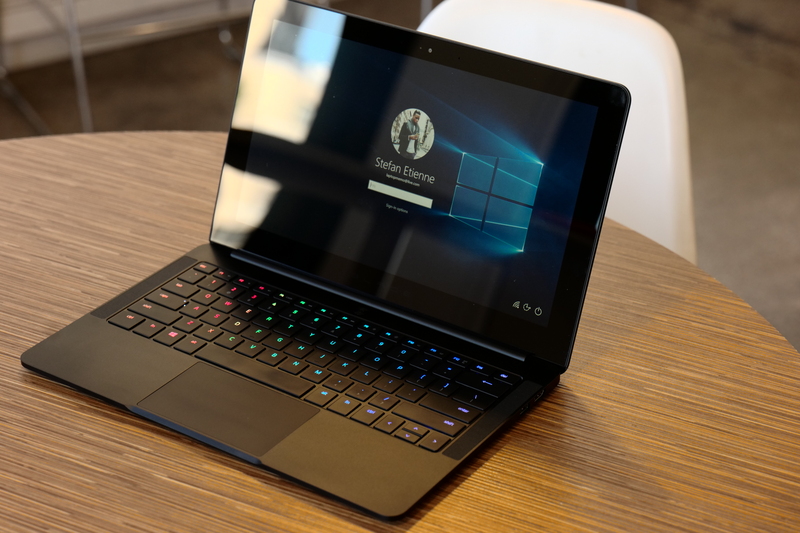 But, that isn’t to say that the Blade Stealth is a failure as an ultrabook — it’s not. In fact it does everything you’d expect of a machine like this: it’s relatively thin (13.1mm), light (2.75 pounds) and to top it all off, is aggressively priced. With a clean, black aluminum unibody as the aesthetic, and decent port selection, you’ll quickly come to the realization you’re wielding a capable computer. There’s enough here through processing power, RAM and pixel density to represent something more than just a “work computer”. You’ll also quickly come to the realization that it’s a dark fingerprint magnet, but sadly, that’s a given with black aluminum. In fact, nothing about the Blade is actually boring — you realize that first with the keyboard. The Chroma keyboard allows for some serious color customization and patterns. Billed by Razer as anti-ghosting, it has decent actuation and is suitable for would-be gamers. Press hard enough near the power button however, and the surface area will flex. So, Razer captured mostly everything that makes a gaming machine fun, then applied that to a “work computer”. That all sounds awesome, right? Well, I couldn’t test it. The screen? It is sharp, with plenty of pixels in either configuration (QHD or 4K/UHD) with 70 percent Adobe RGB color reproduction. Although, its amiability ends with a thick bezel and highly reflective gloss. So yes, wearing sunglasses to type while outside in the sun is a chore. Thankfully, this doesn’t affect battery life too much: it’s already as mediocre as it can be for an ultrabook. The Blade Stealth will last a modest five hours, despite being in a category where competitors last seven hours on a charge, at least. To charge, just use the convenient and small USB-C charging brick — which works out, since it’s best to always have it with you. But that’s not what I’m supposed to be using the Blade Stealth for (work). Technically, I should be playing games off of Steam, but I’ll need a special dock to unlock that capability. How? Through a $500 accessory (yikes) called the Razer Core: an external GPU enclosure with Chroma lights, extra ports and a USB-C connection to make the magic happen. That all sounds awesome, right? Well, I couldn’t test it, since launch for the Core is set sometime in May. Also that’s hilariously expensive, Razer. So, the Blade Stealth becomes a promise of sorts: it promises it can do way more than it actually does, but until it actually does, I can only see the potential. After all, I can’t praise the blade Stealth for what it isn’t! So, it’s time to get mildly philosophical: is a thin laptop with the ability to draw additional resources from other hardware the future of personal computing? The answer: probably not. But it is something that can be entertained, and if in practice it’s actually useful, allowing me to play PC games at full resolution (on and off-screen of the system), then that would be a serious case for the formula that Razer is trying to execute here. 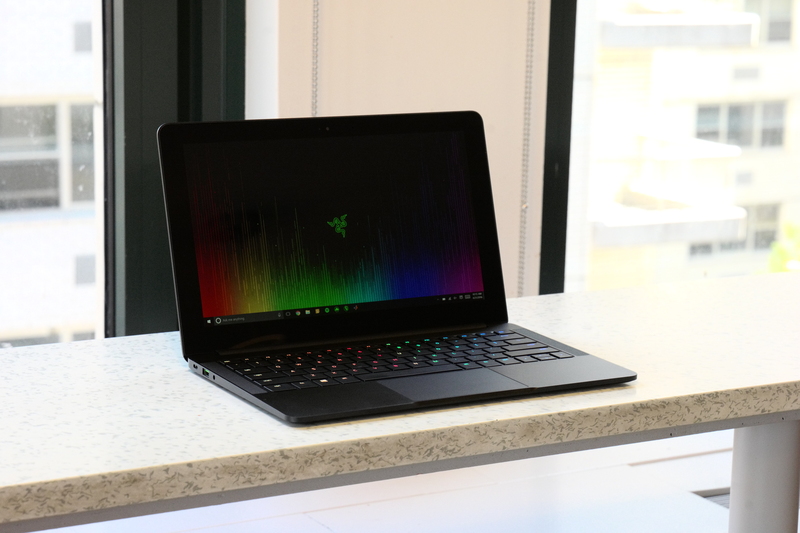 Otherwise, the Raze Blade Stealth makes for a fine ultrabook for someone who wants something unique, has a love of jet black, wants the option of a rainbow-colored keyboard, is eager to use USB-C for everything and to top it all off: has a budget of at least a thousand dollars. It’s worth noting the only difference between this model and the base $999 variant is the storage: 128GB vs. 256GB. It’s either external enclosures or truly ultrabook-sized gaming computers that can represent the future of mobile PC gaming. It’s either external enclosures or truly ultrabook-sized gaming computers that can represent the future of mobile PC gaming. Game streaming has come and gone, leaving the job up to the hardware you’re running with. The Blade Stealth has the potential to do it all, but none of us have seen it do that, yet. Until the Core can be proven as a functional accessory, released into the wild, and used to play games, there’s no way I can call the Blade Stealth a gaming computer, built by a gaming hardware manufacturer — it just isn’t. Not to mention that $500 is a very high premium to pay, excluded from the cost of the Stealth itself, plus the GPU and games that you’ll need. At that rate, the Blade Stealth system costs as much as a new custom desktop gaming rig. Or even worse (for its argument), a well-equipped but bulkier gaming laptop. But for what it is — a thin and light laptop, with a high-res screen and plenty of good specs at the base model — the Stealth is a svelte option for anyone who needs a Windows machine. Also, if you don’t mind throwing a disco party on your keyboard while working.